Weight & Height: 5'3 and 104 lbs. Appearance & Clothing: Skyla has long, blue hair that goes about to her waist with two bangs framing her face. She wears her hair in a variety of hair styles. Most commonly, she has at least some hair in a hair tie. She finds it nice to wear animal-like or cat-like ear attachments which acts like a hair tie as well. Wendy has a variety of outfits, mostly consisting of cute, little dresses. For her footwear, she will wear either sandals or boots. Skyla is fair skinned and quite petite without a fully developed figure yet, further contributing to her young appearance and age. Skyla is thin, mostly due to genetics. Skyla doesn't eat a whole lot of fattening foods though and in her opinion, is fairly active, which also contributes to her thinness. Personality & Behavior: Skyla is one of those cute and sweet, but shy girls. I know it seems very cliché, but that's just how she is. Skyla is quite naive on lots of more mature things. This is only natural being only 13 and protected from those kinds of things. (That last bit was mainly due to being raised by spirits.) Skyla, while she is young, is also quite intelligent and incredibly inquisitive. She feels like she must know the answer to just about everything. Skyla is highly independent. She started living on her own when she was only 7 and took care of herself much better then lots of other 7 year old would have. Skyla, now living on her own as 13, is still as independent as ever. A bad part about Skyla, is her honesty. While she doesn't like to lie a whole lot, her honesty could contradict with what she's supposed to do on an assignment, a job, etc. If she does lie, she feels extremely guilty about it shortly afterwards. Skyla's extreme loyalty to her friends is also a good, but bad thing at the same time. While she may be loyal to friends, if she becomes too loyal to a friend that (may perhaps) turn evil, she would be likely to follow that friend in fear of it damaging her loyalty to that said friend. Skyla wishes to master her Sky Sorcery Nen. That Nen, has been with the sky spirits for generations upon generations. Failing in mastering that Nen, would be failing the sky spirits. She also wants to prove to people that she can take care of herself. This is a huge part of Skyla being very independent. She wants to prove to everyone, that a 13 year old, small girl, like herself, is more then capable of living fully on her own, earning her own money, etc. Skyla was born in a small village in the Gordeau Desert. Her mother was part of genetic modification experiment (this is where Skyla gets her slightly fanged teeth from). Her father was a talented Nen user who used a special Nen that Skyla would never get to know. Her parents, although they loved Skyla, wasn't ready to have a kid yet. They left her at somebody's entrance to a tent, but something happened. She wasn't taken by those people who owned that tent. Instead, she was stolen by spirits. The spirits took her away to a mountainous region where she would live in isolation from other people. All she had was the spirits to be with. These spirits were sky spirits who had seen how much Aura she could potentially possess, (and at an especially young age) and decided to teach her how to use that Aura and, of course, Nen. Skyla's Nen focused around everything sky. This would be called "Sky Sorcery." It was a type of Nen that only powerful sky spirits were known to use. However, Skyla was not a spirit, so she had some aspects of her that some spirits did not which enabled her to learn this ancient Nen so quickly. Skyla loved living with the spirits and learning how to use aura and her Nen. It was all just so fascinating. She often daydreamed about what other humans like her were doing at this point in time. She always wondered about the different types of Nen the humans used. Skyla had only experienced Nen created by the spirits, none that were either said to be created by humans, or even used by humans. Everything was spirit related. The spirits taught Skyla that normally, humans couldn't be trusted and that them finding her abandoned proved it to her. Skyla was confused though. If humans were so untrustworthy, then why would they take her up as their own? Skyla decided to ask them. The main spirit that took care of her told her that the spirit who brought her here was a little different then most spirits and wanted to just try and see what would happen and if she would grow up to be the same as the other humans in relation from human to spirit. Since Skyla was already exposed to the spirits, and since she was so young when she was brought there, the spirits decided that it would just be best anyway for her to stay. Skyla would grow up with the spirits for a long time, and still continues to live with them. When she became 13, they decided that she needed to interact with humans some more. So, they took her to a nice, little town and got a house. These spirits would be in a human form, instead of their spirit form. This human form would make them look as if they actually were Skyla's parents. So, Skyla is currently living with two spirits who are passing off as her parents. After all, they don't want a 13 year old girl wandering around on her own. Gain attention? Who's attention? Ugh, he should really explain things better. Ryko said that he was taking a test to become a guardian of his family. Assama was surprised. Ryko would become a guardian too? Hmm, she wondered how he would react if she told him that she became a guardian before him. Not only that, but she was the first guardian in what had Alina said? Centuries? Yeah, centuries. Ryko said some stuff about his family, the Seikers. Assama didn't know anything on how the Seikers ran things in the family, but whatever this was, it was obviously important. Ryko then proceeded to answer her question on his magic. He said that this was not his Arc of Embodiment, but actual Re-Quip magic. That meant that he had quite a variety of elements to use. Quite useful in many scenarios. Ryko said that he wasn't sure that he could use his water magic now, unless through Re-Quip, but then, he stopped. Assama frowned as she could see that Ryko had that look on him that she's seen patients have at times. He said "oh crap," before falling, unconscious. Assama managed to catch him before he hit the ground, but he was still unconscious. Dang, how much magic energy has he been using? How long has he been awake? Maybe he was sick... Assama now faced a problem. This place was practically a war zone, and Ryko was unconscious. Assama was fine, but attacks would go right through her, and potentially hit Ryko. There had to be somewhere safe here... Maybe someplace like an inn... Assama tried to think of how to best pick him up, and just decided on putting him across his back. He should be conscious enough to hang on for a bit. So, she put him across her back, and ran towards the nearest inn, trying not to get hit by any attacks. She found one, opened the door, and set Ryko down on a couch there. She didn't really care if anyone would be staring at them oddly. Being a mage, she just kind of got used to it. Nen Theme: Sky Sorcery - Sky Sorcery is a type of Nen that has been passed down into the generations of Sky spirits. So far, Skyla is the only person who has been taught it. The Sky Sorcery Nen can make it appear as if the user is "manipulating the sky." Sky Sorcery can also use the air and winds freely, as it is related to the sky. Overall, it is a very air or sky themed Nen. We'll generally need more detail on some things. Most notable Appearance. Strengths and Weaknesses needs a good overhaul as well. Half these points are not exactly personal strengths and weaknesses but more like things that'll be determine by your stat allocation and such. History is a bit shaky, especially towards the end it starts to become very disjointed. Skyla eventually found a nice little town with a nearby forest. Skyla would reside in the forest until she earned enough money to have her own place, and even then, she wouldn't be allowed in. Skyla was, however, told by a nice, couple who ran a bakery , that she could stay in one of the rooms that was mostly rented out by travelers, but for free. It was like having a family she guessed. They just kind of, took her in. Skyla really liked it. When Skyla became 13, she would have to leave that nice couple though. Most of this makes no sense. Living in a forest at 7, somehow earning money, but not being allowed into the city for no reason, then suddenly being allowed and finding a place to stay that dos not require money, then having to leave again for no explained reason. There's a lot of controversy and unexplained things going on in that bit alone. Lastly, the Character Stats sheet needs a little cleaning. If you pick Transmuter for Native Nen, you can set "Transmuter: Rank 0" to Rank 1. Also, a sentence or two or three to explain the basic gist of what your Nen Theme is about should be included. I didn't mean that she wasn't allowed in the town and I didn't say that she earned money when she was 7... I mean that she wasn't allowed in, as in to stay in places like inns because she was too young to be accompanied without an adult, but I changed it up anyway now. You haven't fixed the other things and now your history is a good deal too short, should be around 500 words minimum. Now, that's more like it. Only needed so little tuning to jump the fence. Accepted. Repost to Character Sheets and introduce your Nen ability in more detail for Transmuter over at the Custom Skills. [b]Weight & Height:[/b] 5'3 and 104 lbs. [b]Appearance & Clothing:[/b] Skyla has long, blue hair that goes about to her waist with two bangs framing her face. She wears her hair in a variety of hair styles. Most commonly, she has at least some hair in a hair tie. She finds it nice to wear animal-like or cat-like ear attachments which acts like a hair tie as well. 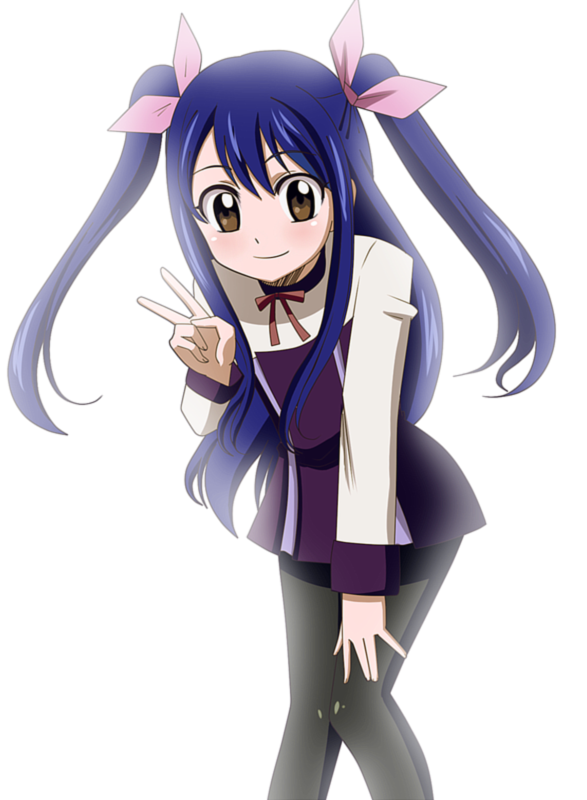 Wendy has a variety of outfits, mostly consisting of cute, little dresses. For her footwear, she will wear either sandals or boots. [b]Personality & Behavior:[/b] Skyla is one of those cute and sweet, but shy girls. I know it seems very cliché, but that's just how she is. Skyla is quite naive on lots of more mature things. This is only natural being only 13 and protected from those kinds of things. (That last bit was mainly due to being raised by spirits.) Skyla, while she is young, is also quite intelligent and incredibly inquisitive. She feels like she must know the answer to just about everything. Skyla is highly independent. She started living on her own when she was only 7 and took care of herself much better then lots of other 7 year old would have. Skyla, now living on her own as 13, is still as independent as ever. The spirits taught Skyla that normally, humans couldn't be trusted and that them finding her abandoned proved it to her. Skyla was confused though. If humans were so untrustworthy, then why would they take her up as their own? Skyla decided to ask them. The main spirit that took care of her told her that the spirit who brought her here was a little different then most spirits and wanted to just [i]try[/i] and see what would happen and if she would grow up to be the same as the other humans in relation from human to spirit. Since Skyla was already exposed to the spirits, and since she was so young when she was brought there, the spirits decided that it would just be best anyway for her to stay. [b]Nen Theme:[/b] Sky Sorcery - Sky Sorcery is a type of Nen that has been passed down into the generations of Sky spirits. So far, Skyla is the only person who has been taught it. The Sky Sorcery Nen can make it appear as if the user is "manipulating the sky." Sky Sorcery can also use the air and winds freely, as it is related to the sky. Overall, it is a very air or sky themed Nen.